Here’s the Tokyo version of the WHD Dance. It is one of 32 videos that I’ve received so far for the WHD Dance compilation video. 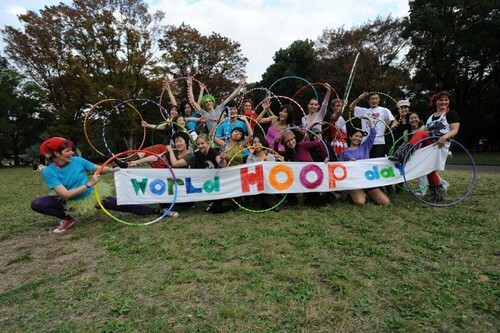 Our World Hoop Day event on Saturday raised over 55,000 yen (about $720) to send hoops to kids in Tohoku and on the Peace Boat, and we also decorated and donated 25 hoops that day. I wil be shipping those hoops up to our partners in Tohoku later this week. Thank you everyone for your generosity! The park cops shutting us down for having a sign and an amp (stupid rules! ); sad faces and no music for ten minutes, then it was back to normal…without the sign.